V stredu 23. septembra pozývame všetkých na účasť na medzinárodnej sv. omši Mass for Europe, ktorú bude celebrovať Mons Andre-Joseph, arcibiskup pre Malines-Brusel, v kostole Notre-Dame au Sablon. 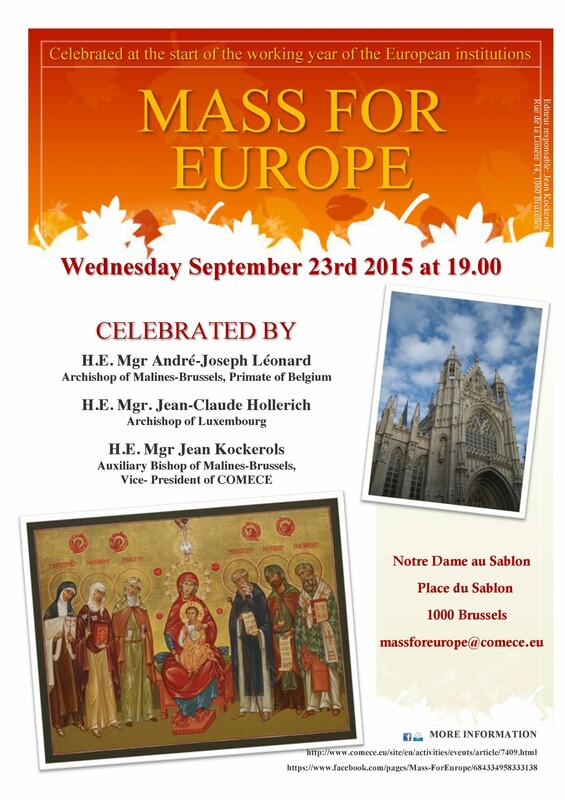 On the occasion of the start of the working year of the European Institutions under the Presidency of Luxembourg, COMECE cordially invites you to participate in the Mass for Europe at the church of Notre-Dame au Sablon, Brussels, Wednesday 23 September at 19.00. The Principal Celebrant will be His Excellency Mgr Andre-Joseph Leonard, Archbishop of Malines-Brussels and the preacher will be His Excellency Mgr H.E. Mgr. Jean-Claude Hollerich, Archbishop of Luxembourg. The Mass will be concelebrated by His Excellency Mgr Jean Kockerols, Auxiliary bishop of Malines-Brussels and Vice-President of COMECE, Belgium. His Excellency Mgr Alain Lebeaupin, Apostolic Nuncio to the European Union, will also be present. The offertory will be held for Josefa foundation, whose mission is helping people made vulnerable by migration.